3 nights of lodging, 4 days of fun! 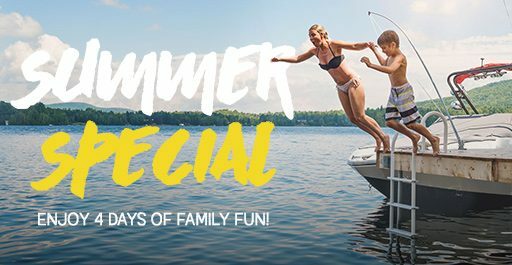 Come in early season and save $150-$175 over peak summer rates! Lodging in a Lakeside Fireplace Room for up to 4 people. FREE Sunday Welcome Party, dinner buffet and entertainment. Breakfast included each morning for your family. First round of golf or FootGolf FREE on Legacy Par 3 Course. Check out our Activity Schedule for all of the fun stuff we have planned this summer including pontoon cruises, horse drawn trolley rides, free rowboats and canoes, fishing clinic and bingo. Enjoy Cragun’s two swimming pools, two sandy beaches, biking and hiking trails and our indoor Sports Centre. 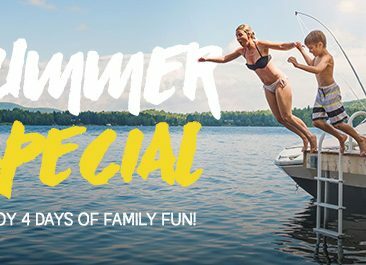 Call our Vacation Sales Department at 800-272-4867 to get the details on the above dates or information on other room types and cabins available this summer. Prices subject to change based on availability.